Back in early October, the market catalyst that killed the US rally and sent stocks tumbling into a brief bear market after Powell warned that the neutral rate was a "long way away", was the sudden spike in yields, which surged above 3.3%, breaking out above long-term resistance, and leading to renewed speculation that the 30 year long bull market in bonds is (again) officially over. But while US yields have remained stubbornly low, perhaps in anticipation of rate cuts and/or QE4, perhaps due to increased buying from foreigners due to sliding FX hedging costs, there is one place where yields have recently soared much higher: the same place whose massive credit expansion in the past three months has led to renewed hopes for global "green shoots", and speculation that the economic slump is now over - China. After surging in the the first two weeks of April at the fastest pace in more than 2 years, on Monday Chinese ten-year yields rose to 3.38% Monday, extending their highest levels this year. 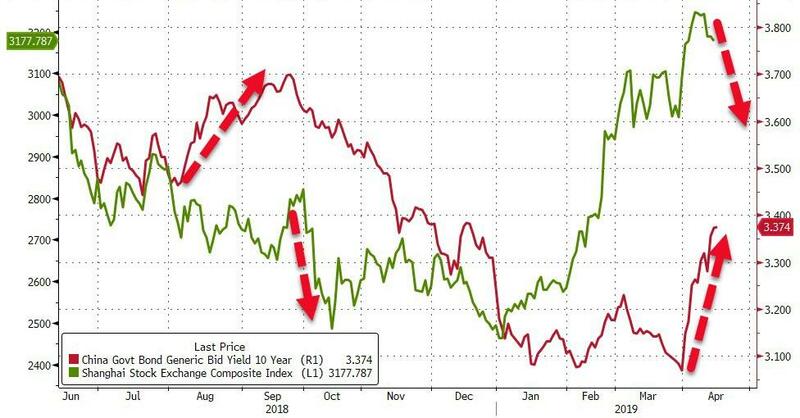 And while for much of the recent advance Chinese equities were willing to ignore the spike in interest rates, in the past week Chinese stocks have been ominously toppy, and have continued to slide in Tuesday's session. As a result, and perhaps due to fears that Chinese liquidity is again getting too tight, on Tuesday the PBOC broke its streak of 18 consecutive days without open market interventions, and injected a net of 40 billion yuan via 7 day reverse repos. That plus concerns that the Chinese central bank will not cut rates as previously consensus had expected, stocks have topped out, even as 10Y yields have continued marching higher, and hit 3.40% in early Tuesday trading, the highest level since mid-December. In other words as Bloomberg's Wes Goodman writes, while the PBOC says it will keep good control of the money supply, "yields may have more to rise even if the central bank is trying to temper the pace of the advance." The risk is that if yields rise even higher, the rally in Chinese stocks - which has outperformed all major markets in 2019 - is now officially over. And, all else equal, it does appears that Chinese liquidity will shrink even more in the coming weeks, and local markets will face tighter credit conditions this quarter than in 1Q after the PBOC indicated the current pace had gone beyond its target. That, as Yinan Zhao cautions, is going to add to the pain for slumping sovereign bonds as investors face an uncertain economic outlook and reduced chances for stronger easing. 1Q credit growth at 10.7% was way above the PBOC’s goal to keep it “in line with the pace of nominal GDP,” a range it specifically emphasized in yesterday’s policy statement. It usually doesn’t go into that much detail on credit growth goals. The PBOC emphasized a need for a balanced approach. Given 10-year yields are rising at the fastest pace in more than 2 years, that's perhaps not the message fixed-income investors would have been hoping for. But wait, there's more: while US traders are casting a fearful eye on just how bad the EPS contraction in Q1 earnings season will be (and whether it will recover in Q2 and onward) in China it will be far worse. Indeed, the sharp Monday slump in Chinese small caps "underscores the dangers for mainland stock markets as what could be an ugly earnings season kicks off and steals the limelight from stimulus hopes", as Bloomberg's Kyoungwha Kim writes today. Here's the punchline: while US stocks are expected to post a roughly 4% drop Y/Y, China small cap earnings will be a massacre, with Q1 EPS on the ChiNext board forecast to slump 29% y/y, following a 12% drop in the prior quarter. That's in line with China's dour Jan.-Feb. economic data. 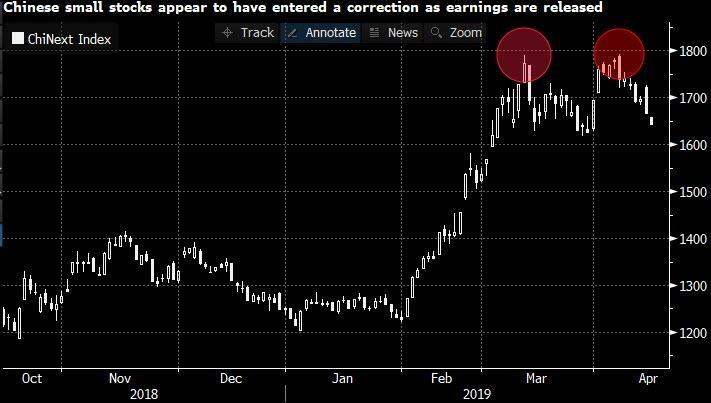 Paradoxically, as earnings tumbled, the ChiNext index soared by over 35% during the same period, so any disappointment in earnings will lead traders to rush for the exits... especially if rates keep rising as liquidity shrinks. This will keep markets volatile in April, especially as the ChiNext's double top formation sets the gauge up for a correction. The silver lining in China, just like in the US, is that any earnings recession is expected to be brief: in Q2 earnings are already predicted to rebound, largely thanks to the recent VAT cut, with overall 2019 EPS growth for the ChiNext seen at 52%. Whether or not that happens will ultimately depend on whether Chinese interest rates keep rising from here, and will also likely determine the fate of the global rally which, all else equals, is now entering extremely overbought territory.